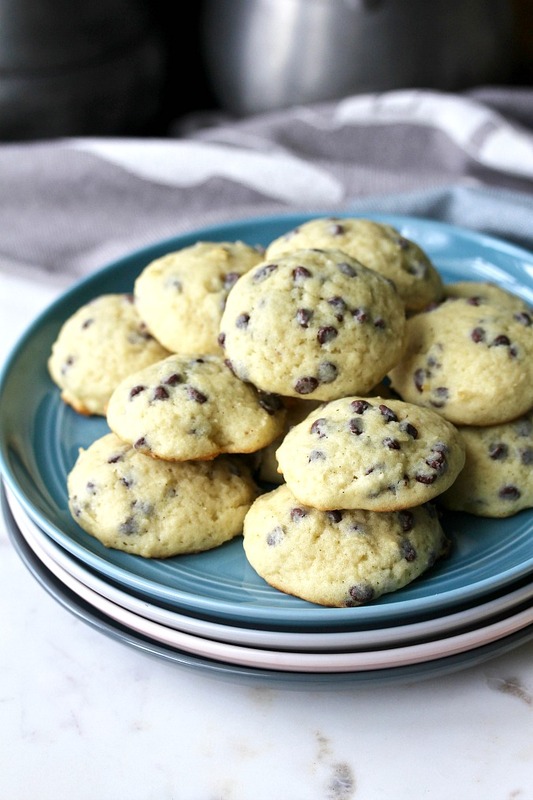 These ricotta chocolate chip cookies are so soft and cake-like. They are pretty much little cakes in a cookie form. 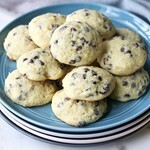 While most chocolate chip cookies are either crispy or chewy, these ricotta chocolate chip cookies are tender and soft. They get this way from the ricotta cheese. It's pretty magical. 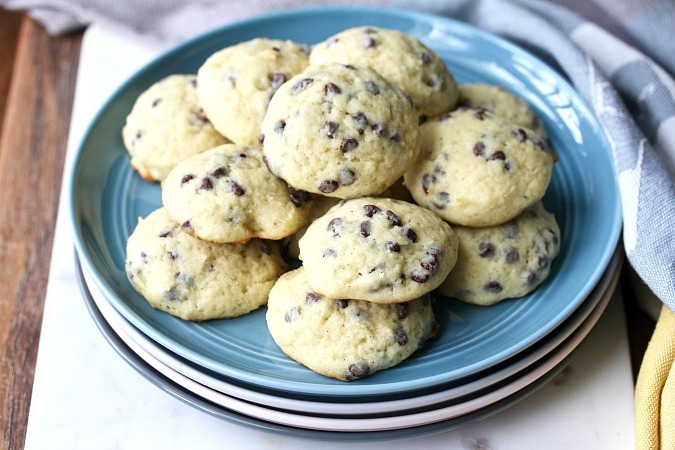 Be sure to use mini chocolate chips in these ricotta chocolate chip cookies so that the cookies will form into fluffy rounds with the chips evenly distributed throughout the cookies. I took these cookies to work to share, and they were a huge hit. 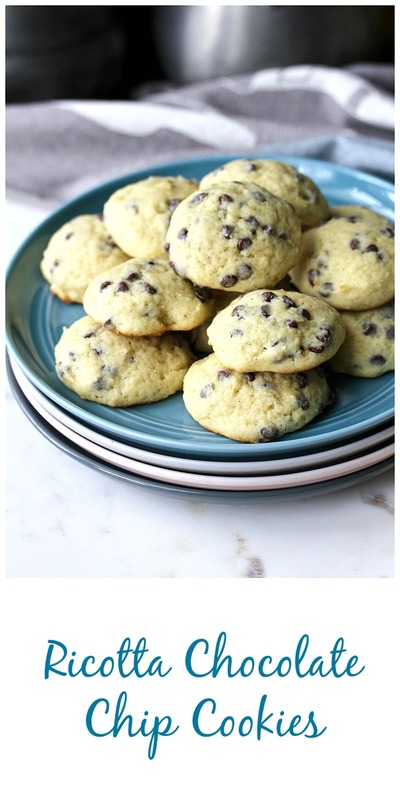 They are perfect for when you are craving a soft cookie. In addition, they would be easy to ship during the holidays because they would hold their shape and not turn into crumbs. Plus, they stay fresh for up to 5 days in an airtight container. Heat your oven to 350 degrees F with an oven rack in the middle. Line 2 half sheet pans with parchment paper. In a bowl, whisk together the flour, salt, and baking soda. In a stand mixer with the paddle attachment, beat the butter and sugar on medium-high until fluffy, about 3 minutes. Add the egg, egg yolk, and the vanilla, and beat until combined. Reduce the speed to low and add the flour in thirds, alternating with the ricotta in 2 additions. Using a tablespoon scoop or a heaping tablespoon, drop the dough onto the baking sheets. Bake the cookies, one sheet at a time, for 12 to 14 minutes, until set on the edges. Cool the cookies on the baking sheets for 5 minutes, and then transfer them to a wire rack. No summer outdoor feast is complete without a platter of cookies and the Creative Cookie Exchange has some to share this month in time for Memorial Day getting the outdoor potluck season started. You can also use us as a great resource for cookie recipes. Be sure to check out our Pinterest Board and our monthly posts (you can find all of them here at The Spiced Life). You will be able to find them the first Tuesday after the 15th of each month! If you are a blogger and want to join in the fun, contact Laura at thespicedlife AT gmail DOT com and she will get you added to our Facebook group, where we discuss our cookies and share links. I bet you have a terrific recipe for ricotta cookies. The chocolate chips are delicious in these. Saving for the near future! It's so much fun watching them fly off the plate! Thanks Sally. These are amazing! I don't know why I waited so long to make them. My husband has declared this his new favorite cookie!